Click on the wine names to read more technical information. No matter whether it's for wines under the Bordeaux appellation or those under the Saint-Emilion name, we are equally intransigent in ensuring perfect ripeness of our grapes. 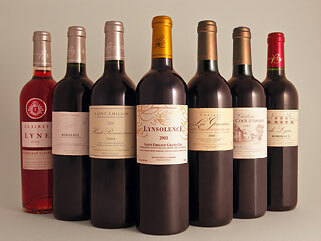 Lynsolence, Saint-Emilion Grand Cru, is vinified from several parcels having exceptional qualities. Yields are extremely low, between 19 and 25 Hl/Ha so as to give a great wine that is both powerful and full of fruit. 100% Merlot. Château Les Gravières is a Saint-Emilion Grand Cru made from our vines at Saint-Sulpice de Faleyrens. It's a dense and concentrated wine with yields of around 35 Hl/Ha. 100% Merlot. Haut-Renaissance, with the appellation Saint-Emilion, is vinified from our vines in the communes of Saint-Pey d'Armens and Saint Laurent des Combes, with yields averaging 45Hl/Ha. 100% Merlot. It is a rounded, full bodied wine without coarseness. These are rounded fruity wines which are very approachable when young, but nonetheless have good aging potential. 95% Merlot. Clairet De Lyne with the appellation Bordeaux Clairet is an expressive rosé wine, full of fruit. It's made using the saignée technique and thus benefits in part from the Saint-Emilion terroir.